This square invitation features a beach scene with rolling waves, perfect for beach weddings. Like this wedding invitation? You can personalize it with your own wording and details at invitationconsultants. Adios Script is an elegant script typeface designed by Argentinian type designer Alejandro Paul. Inspired by designs in “how-to” commercial lettering guides of the 1940s, Adios Script has been refined and brought into the 21st century through a huge variety of ornate swash letterforms. Hundreds of ornamental ascenders and descenders allow a beautiful interplay of strokes and combinations, making it a perfect choice for headings, posters etc. 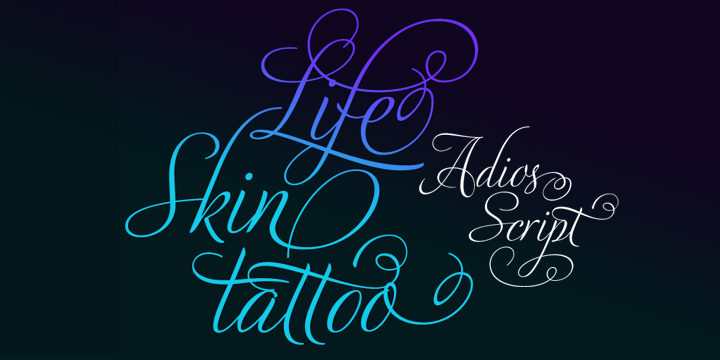 You can buy and download Adios Script at Myfonts.